Basawa, I.V. & Scott, D.J. (1983) Asymptotic Optimal Inference for Non-ergodic Models. Lecture Notes in Statistics 17. Springer-Verlag. Bhat, B.R. (1974) On the method of maximum-likelihood for dependent observations. Journal of the Royal Statistical Society, Series B 36, 48–53. Billingsley, P. (1961) Statistical Inference for Markov Processes. University of Chicago Press. Bose, Arup (1983a) Asymptotic theory of estimation in non-linear stochastic differential equations for the multiparameter case. Sankhyā, Series A 45, 56–65. Bose, Arup (1983b) The Bernstein-von Mises theorem for a certain class of diffusion processes. Sankhyā, Series A 45, 150–160. Chakravarti, I.M., Laha, R.G., & Roy, J. (1967) Handbook of Methods of Applied Statistics, vol. 1. Wiley. Chernoff, H. (1964) Estimation of the mode. Annals of the Institute of Statistical Mathematics 16, 31–41. Ibragimov, I.A. & Khasminski, R.Z. (1981) Statistical Estimation: Asymptotic Theory. Springer-Verlag. Jeganathan, P. (1982) On the asymptotic theory of estimation when the limit of the log-likelihood ratio is mixed normal. Sankhyā 44, 173–212. Kallianpur, G. & Rao, C.R. (1955) On Fisher’s lower bound to asymptotic variance of a consistent estimat. Sankhyā 16, 331–342. Le Cam, L. & Yang, C.L. (2000) Asymptotics in Statistics: Some Basic Concepts, 2nd ed.Springer-Verlag. Parzen, E. (1954) On uniform convergence of families of sequences of random variables. University of California Publications in Statistics 2, pp. 23–53. 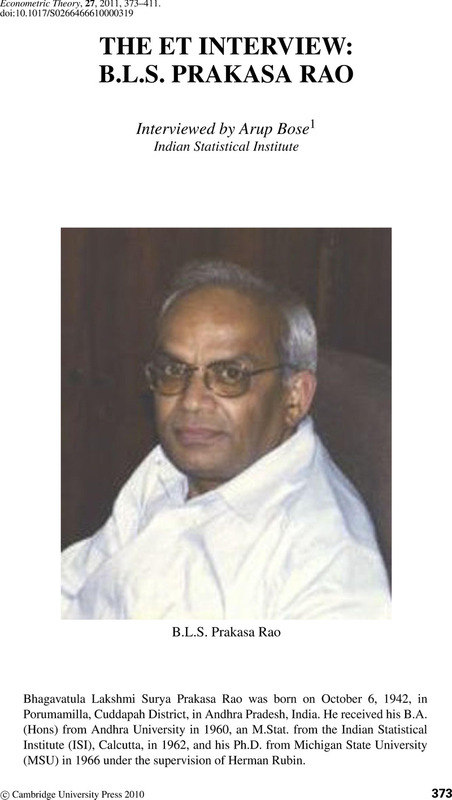 Prakasa Rao, B.L.S. & Sen, Arusharka (1995a) An application of the “martingale methods” to nonparametric regression based on censored data. Statistics & Decisions 13, 201–220. Prakasa Rao, B.L.S. & Sen, Arusharka (1995b) Limit distributions of conditional U-statistics. Journal of Theoretical Probability 8, 261–301. Prasad, M.S. & Prakasa Rao, B.L.S. (1976) Maximum likelihood estimation for dependent random variables. Journal of the Indian Statistical Association 14, 75–97. Rao, C.R., Mitra, S.K., & Matthai, A. (1996) Formulae and Tables for Statistical Work. Calcutta Statistical Publishing Society. Roussas, G.G. (1991) Kernel estimates under association: Strong uniform consistency. Statistics and Probability Letters 12, 393–403. Roussas, G.G. (2008) On conditional independence, mixing and association, Stochastic Analysis and Applications 26, 1274–1309.